Newer homes have moved away from floor plans with a formal dining room. Most people want homes with rooms that they can live in every day, not a cordoned off dining space that is only occupied on major holidays. The good news is that today there are many options for multi-functional dining furniture that easily shift a room from a homework or crafting area to an elegant dining space. 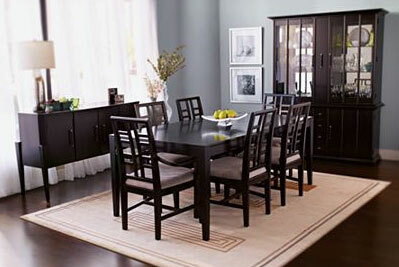 If you’re looking for versatility, a server is a great flexible piece to include in your dining room. Living up to its name, the server acts as an extension of the kitchen, offering additional countertop space and a place to set serving dishes at crowded meals. Servers typically include drawers, doors, or combinations of the two. These can be used to store dishes and linens, or tuck away office supplies and crafting materials. Some manufacturers equip their servers with electrical outlets for a convenient way to keep crock pots hot or coffee brewing nearby. If you need more storage or would like to show off dishware, you might consider a buffet with a hutch. This will allow you to store your dishes and keep them easily accessible, but it will show off your best pieces when not in use. A cupboard or “dresser” used in a dining room to hold platters and serving dishes. Occasionally paired with a china cabinet hutch on top. Often used in dining rooms, china cabinets generally consist of an upper portion with glass-doored display case, and lower enclosed cabinet for storage. A buffet, sideboard or bookcase, typically with a functional top surface near table height. A display case with a glass front and sides, and without enclosed cabinet space. Most modern curio cabinets incorporate interior lighting, glass shelves, and a mirrored back. Originally an outdoor piece of furniture, huntboards were designed to give hunters on horseback a surface to drop their game on without dismounting. Now used indoors, they are serving and storage pieces that are taller than conventional servers. An upper cabinet with open shelves or doors that is placed atop a buffet or desk. 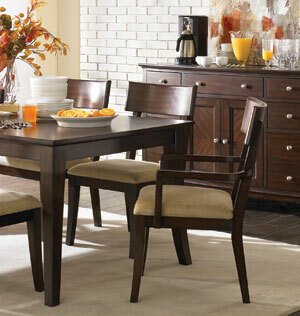 A table and storage piece, used in dining rooms, that is relatively shallow and intended to be used against a wall. Traditionally, food is stored on top prior to being brought to the table. 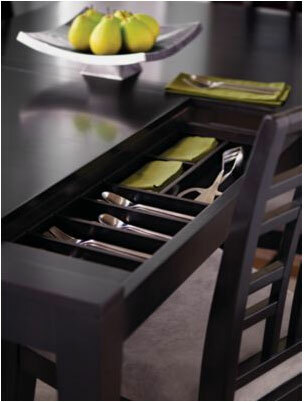 Drawers may be used to store silverware, linens, or other dining room necessities.